Last Friday, Emily Bush, Leslie Scofield, and Alison Burger hosted “Women of Crypto,” one of the most well attended events at #RestartWeek. The event, held on the rooftop of Sage Steak Loft in Condado, Puerto Rico, featured talks from Shankhri Balaji (FR8), Louise O’Rierdan (VOY), Lisa Moynihan (Blockchain Industries), and Leah Feingold (Lottery.com). 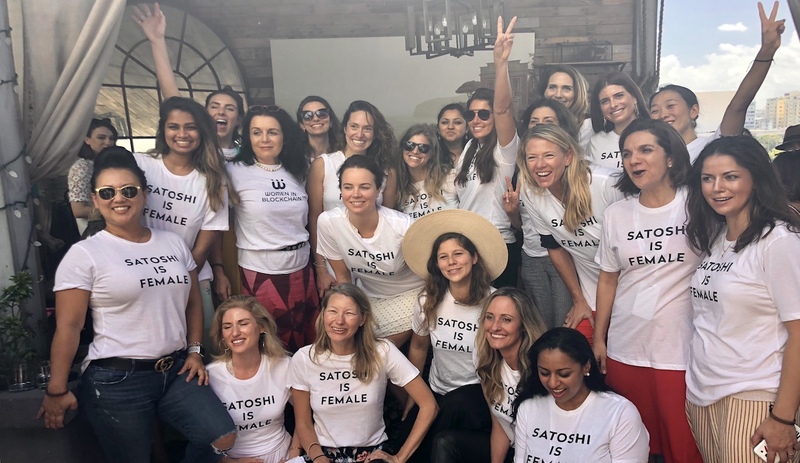 The focus of the event was for female attendees of Blockchain Unbound to connect and promote diversity in the industry. Attendees were encouraged to share Blockchain or ICO projects that had launched (or are being launched) and match them with women looking to invest, collaborate, or hire. The shirts were created by the CEO & Founder of nonprofit organization Mama Hope, Nyla Rodgers, who recently wrote a Medium article explaining her point of view (the shirt, plus tote bags and stickers can be purchased here). In summary, she writes that Blockchain and Digital Currency promote an inherently female approach via five key ways: Collaboration, Inclusion, Values-Driven, Community Centered, and Generosity. With Blockchain still in the relatively early days, we have the opportunity to intentionally craft a culture with inclusion and diversity. With events like this and the 25 speakers at the New Girls on the Block Conference at SXSW, it’s clear that there are plenty of bright females leading this nascent industry.